Download a blank fillable Dd Form 2570 - Third Party Collection Program - Report On Program Results in PDF format just by clicking the "DOWNLOAD PDF" button. 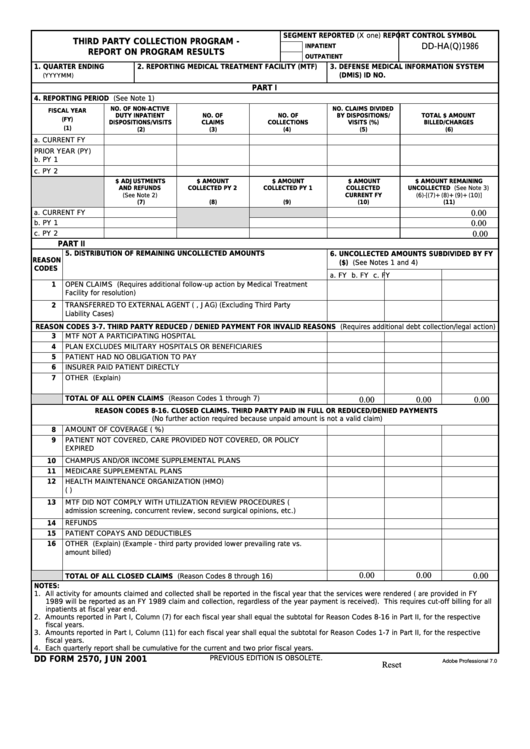 Complete Dd Form 2570 - Third Party Collection Program - Report On Program Results with your personal data - all interactive fields are highlighted in places where you should type, access drop-down lists or select multiple-choice options. OTHER (Explain) (Example - third party provided lower prevailing rate vs.
inpatients at fiscal year end. 4. Each quarterly report shall be cumulative for the current and two prior fiscal years.